Garden Bytes from the Big Apple: Chicago ain't the only windy city. I grew up when winters were winters and schools didn't close for a paltry few inches of snow. I'm not bragging...I just want you to understand that cold weather doesn't freak me out. I can take it. I'm not so sure about the trees. It's been a windy winter and terrace trees are super susceptible (I'm on an alliterative tear) to tipping. A tree tips over in the forest and chances are no one gets hurt. On a terrace over East 79th Street, it's an entirely different matter. 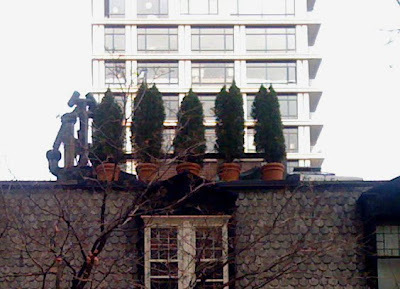 I was over by the East River, looking down, when I noticed these arborvitae. Are they attached to anything? I hope so. 1) Thinning a tree's canopy decreases the surface area of the sail enough to keep the tree from going mobile. Try pruning out 20-25% of the horizontal branches. 2) Make sure your tree isn't too heavy for its container. Inadequate weight in the container makes it easier for the tree to tip. On rooftops we choose light weight containers and potting mixes, PLUS, winter soil is dry, and dry soil is light. This is a recipe for disaster. Keep an eye on the relative masses of your top growth and container. A big tree needs a heavy pot. 3) Square and rectangular containers are more stable than circular pots. On an especially windy terrace, use a quadrilateral container. 4) Tie it down! I use heavy gauge wire and pieces of garden hose to attach tree trunks to terrace railings. Cut the hose into 12' pieces and run the wire through it, then wire the tree in place, making sure the hose section is up against the tree trunk. The hose keeps the wire from cutting into the trunk when the wire becomes taut. Each tree should be wired at two or three points along the trunk, just in case. I walked by my windiest terrace last week and from 18 floors below I could see that several trees had tipped over (actual trees above). I have pruned them, I have wired them, but still they tip. The pots are wicked heavy. Definitely heavier than the top growth. And yet they tip. I've suggested square containers to replace the round pots but I've met with resistance. I've suggested my client donate the biggest trees to the building's garden and replace them with smaller shrubs. She'll think about it. Really great post. Since they live in such close proximity to each other, urban dwellers need to pay attention to safety concerns such as these. 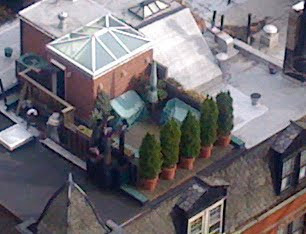 That one rooftop looks like it should have a short wall or railing, doesn't seem like it should be legal. It's true, rooftop gardeners have lots of extra stuff to watch out for, including the possibility of massive lawsuits and unusual homeowners insurance riders! I've often thought of this. Especially in the xtra cold winters like this year. Those arborvitae are just asking for it!